Developed by Messhof. Published by Messhof. Released January 13 2014. Available on PC. 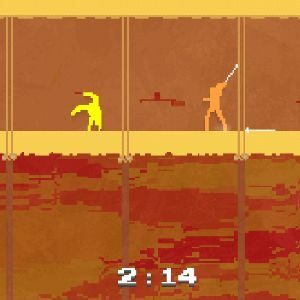 At its most basic level, Nidhogg is an arcade-style fencing game, and it strangely reminds me of what I'd expect Suda 51 to make if he were looking to get into the competitive multiplayer space. It's awkward, creepy and unnerving, but it's also sinfully hilarious and surprisingly deep. Two players square off in a linear, 2D arena, both trying to rack up kills and push combat closer to their goals which lie at opposite ends of the map. Both players start off in a neutral area, but must kill to move the game forward in either direction. To help along the bloodletting, both players have sabers as well as a handful of acrobatic maneuvers to help cross-up, disarm and ultimately kill the opposition. Each death brings with it a ludicrous shower of pixelated, monochromatic viscera and a brief opportunity for the killer to make a bit of progress, before having to face off against a revived defender. Competitive play revolves around a frenetic set of skirmishes. Players will dance around one another, pulling out their best mind-games and vying for better positioning. Locked in a sadistic match of reverse tug-of-war, Nidhogg works best when the match is nearing an end. It's not uncommon, for example, for a defending player to stop the advance of an attacker at the last moment and press the battlefront all the way back to the beginning of the map. It may be a struggle, but it's one that never lets you feel helpless or completely outclassed, just because of the ludicrous number of options you'll typically have at your disposal. At any given point you can toss your sword for an extremely aggressive ranged attack (albeit one that leaves you defenseless), or you could try to out-maneuver your foe with jumps and aerials. You can approach directly and try to fake-out your opponent with some deceptively mistimed lunges revealing a weakness in their guard. Some areas have conveyor belts; some have additional platforms that require an attacker to repeatedly place themselves at greater risk. Opening up holes in the defense and then pressing that advantage is the key, but you'll notice that all of this really relies on playing against other human opponents. While Nidhogg has a single-player mode that will pit you against some increasingly difficult computer-powered foes, after a while it becomes clear that their AI just isn't the same as a human opponent. Mind games, and a real, breathing person that can mix up their approach, defense and regularly take some pretty wacky risks make for much better matches than a stilted opponent driven by algorithms. Thankfully, Nidhogg does have a few options for playing with others. There's a fairly robust (for an indie title) online matchmaking system that works pretty well most of the time. You can set up matches and choose any of the game's four stages for a quick bit of fun, or challenge some of your friends on Steam. For the best experience, though, you'll want to grab a few real-life friends and really dig into some of the local-only options. There are about a dozen options, not unlike those you'd find in the more ridiculous variants of Super Smash Bros. that include boomerang swords, a "skippy" mode where the only mode of transportation is jumping and a "baby mode" where your sabreur can't stand up. Taken together they're great additions to an already really tight product. Nidhogg has already given me some of my favorite multiplayer experiences in recent years, and I have no doubt that there will be a strong cult community around the game for years to come. That aside, once you've seen what Nidhogg has to offer, there's not a whole lot more. The single player "campaign", if you can call it that, lasts an hour or so at most, and even with the extensive options for multiplayer, you still only have four stages to play with. If you're one of those crazy folks that still plays Super Smash Bros. Melee with friends (like myself), 12 years after release, then Nidhogg gets a solid recommendation, otherwise it's not going to be worth your cash. Bottom line: Nidhogg is a strange, unholy pastiche of lo-fi aesthetics and surprisingly deep, albeit minimal play; taking cues from decades of arcade-style 1v1 fighting games and modern indie darlings. Recommendation: If you have a friend or two with a copy already, go ahead and pick this up; otherwise, it's probably not worth the $15.